I’m so excited to announce I’m running a Make It From Scratch Challenge next week! Well, basically it will be 5 days of encouraging you to try making/cooking/baking things from scratch. As in, no kits or pre-packaged boxes allowed. I thought it would be a fun challenge — and something just about everyone can participate in. You can choose to make homemade cleaners, or tackle a DIY project, or bake something from scratch. Or, you can just follow along as I attempt some new from scratch ideas. If you already make most everything from scratch, then I encourage you to try some new ideas/recipes. If you don’t make much from scratch, this can inspire you to branch out, be brave, and try! Who’s joining me? Come back on to see what I experimented with and to link up your Make it From Scratch blog posts, too! Looking for more? 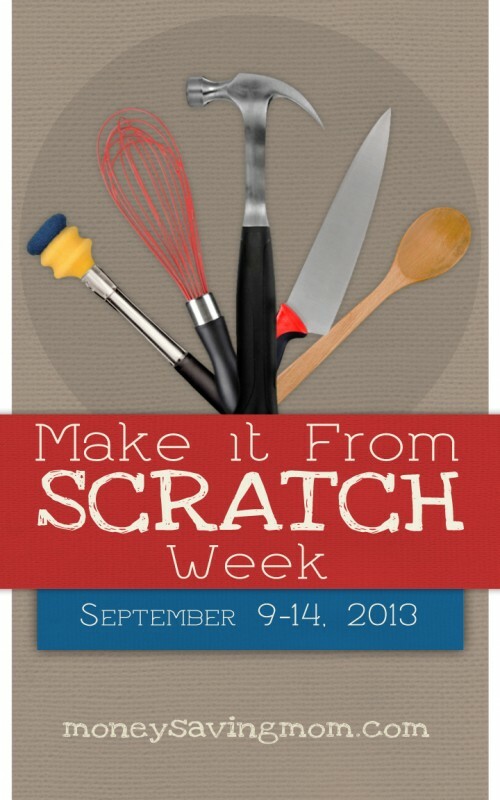 Read more posts about Make It From Scratch Challenge. Yay! I LOVE this idea. I have been lazy in this area. Hopefully it will kick me in gear! Oh this will be so much FUN!!! I mostly never use boxes for anything & havn’t for many years, but always open to new recipes. Looking forward to it!!! Me too! I do a lot of freezer cooking, canning, and such, so that I can make a meal in 15 minutes, throw dinner in the crockpot before starting my day, or feed unexpected company. Very interested to see what everyone tries! So glad you’ll be joining us! We hardly ever eat pre-packaged meals though so this challenge is right up my alley. This is a great idea! Can’t wait to follow. Oh, I would love this but I have to say I am not a good cook and never bake from scratch. I have always wanted to but my family will tell you I am a horrible cook. I really need this. I so want to do better in that area. I guess you can say I am a box kind of girl! :0) Maybe this will inspire me to learn. You can do it! We’re cheering for you! I have been in your shoes before! I never learned to cook growing up so I got married and my husband had to teach me how to do anything that needed to be done. After 16 years of marriage I have finally started making things from scratch but it has all started with me looking up some like “homemade biscuits” and putting the magic word “easy” in front of it! As I get more confident with each item I don’t need the “easy” as much but it was where I had to start without poisoning my family! You can do this! It will lead to a serious feeling of accomplishment! I can’t wait to see what’s happening this week! I hate to use any recipe that uses a boxed mix. I’m not saying they aren’t good, but it feels like cheating. I used to have a great one too for a chocolate bunt cake that you added pudding mix and sour cream, then chocolate chips to. I can’t find it anywhere. I’m in! I am a cook from scratch everyday kind of cook because the box stuff is just not good. I am up for new ideas! Sounds like fun! I have recently started making homemade bagels and hamburger rolls. We are now incredibly spoiled! I am up for trying something new! Anything I cook myself is so much better than what I buy at the store, not to mention it’s usually cheaper and healthier, so I’m totally excited about this challenge. I have some ideas for make it from scratch that have been percolating in my head for a while, maybe this series will be the kick in the pants I need. I’m also game for trying homemade cleaners, which I’ve never done before, other than my baking soda and white vinegar concoction for keeping the kitchen sink drain clean. You sound just like me when it comes to crafts! I found a good homemade glass cleaner recipe on Pinterest. Basically vinegar and rubbing alcohol. Works great. So if we always cook from scratch, is the challenge to cook something new from scratch? As in, try a new recipe? Next week I’m planning on making either moouse or pavlova for a birthday cake for my daughter. Either way I’ll be making homemade whipped cream for it! Are you going to do a different post on DIY ideas that are non-food related? Or are non-food related posts part of this next week’s challenge as well? I have some sewing projects planned for next week as well. I’m just wondering what to link up! You can link up any type of DIY project… sewing projects, household DIY projects, new recipes, cleaning products. I’m leaving things pretty open to whatever you want to try! Maybe I’ll finially conquer my fear of yeast and actually make several recipes I’ve been wanting to for over two years, even though I bought a bread machine at goodwill for this reason and still haven’t used it. Marie, I’m curious: why are you afraid of yeast? I always proof my yeast when I bake. I make sure the water is between 105º and 110ºF and then I add my yeast (in about half a coup of water). I wait about 5 minutes, and if it proofs, it bubbles up, and you know it’s good. I’ve used old yeast before (past the expiration date by more than a year) and it still proofs. As long as it proofs, you know it’s still good, and your bread will rise! Marie, yeast and I don’t have a good relationship. I can relate to you. I too am a little afraid of it. I think I just don’t have the patience! Yeast isn’t scary, I promise! I don’t even use a thermometer. If the water feels about like a comfortable bath (not too hot, not too cold), it’s typically just right for yeast. And as the Prudent Homemaker said, if the yeast bubbles up, you’re good to go. Or you can buy instant yeast. I think that stuff is pretty foolproof. Just use name brand. I’ve tried store brand yeast before, and it was horrible. Fleischmann’s all the way for me! Get in there and make use of your Goodwill bread machine. I bought mine there a few years ago and have loved making my own bread. If nothing more than the lovely aroma of the homemade bread, it is worth it! Recipes can be found in abundance online. I use my bread machine for mostly making dough. A 2 lb loaf will make. 2 pizzas (cook one freeze one)/ about 15 hotdogs on a bun/ 15 buns. 1/2 pans cinnamon rolls. Takes my hand me fown machine 90 minutes to make. I am going to join this.. maybe some bread from scratch. I am excited and nervous..
I’m over here cheering for you! I’m in, I cook from scratch quite a bit, but we do purchase crackers and chips so maybe I’ll tackle making those from scratch this upcoming week. I just posted yesterday about my DIY deck cleaning and re-sealing project I completed that probably would have worked for the challenge. I will definitely join you! we always cook from scratch and almost never use any boxes except for crushed tomatoes to make tomatoe sauce. I’m looking forward for some healthy new recipes to try. love your blog. So excited!! I think I’m going to split my week between DIY and recipes! I’ve got a yard sale cabinet in my garage waiting to be refinished for my laundry room!!! Sounds like the perfect week to tackle it. I can’t wait to see your finished projects! Sounds like a good time for me to try homemade tortillas or English muffins. They have been on my try it list. Store-bought tortillas have never looked so delightful. 99 cents for twelve, and I’ll gratefully pay every loving penny. I’m the opposite. I am so used to the delightfully soft puffiness of fresh, homemade tortillas that recently when I had to pay $3 for 8 burrito sized tortillas for quesadillas…not only did it hurt my wallet…but they just tasted…flat. I use the recipe from the Dining on a Dime cookbook. It’s a bit more work especially the rolling out…but my son loves to help. I was just thinking tonight about a friend who is a vegetarian, she was surprised when I offered to make her veggie burgers for a cookout at our house as I know the store bought ones are super pricy and I probably had all the ingredients at home anyway. She said to me, “You can make those?” It got me thinking about when I made the switch from boxed foods to “from scratch” meals. It was after my husband refused to eat hamburger helper and around the time I tried my hand at gardening (also started buying into a local CSA) and had to find a use for all the veggies! It is so healthy to challenge ourselves, if you never try something then you’ll never learn from it! Perhaps this week I will find a few things I’ve been wanting to try for a while but just haven’t gotten around to it. Like home made crackers! I am in!! Love making foods from scratch because it tastes great and saves me a bundle on groceries for my large crew. Thanks for hosting this great idea! Sounds awesome. Anything that encourages me to actual make things I’ve pinned on Pinterest is great. I had good success with homemade glass cleaner and homemade detangler. The other day I made a homemade headband holder out of a oatmeal container and duct tape. Turned out super cute and makes it handy for my 7 yr old to keep her headbands neat. For the make from scratch challenge I think I’m going to give baking bread another try and maybe some new desserts. Yummy! I love the homemade headband holder idea! Love this! We have been a “from scratch” household for a while now. Can’t wait to see what you do. Yeah! I love this! I make SO many more things from scratch than I used to. In fact, I just finished a brand-new Homemade Soft Pretzel recipe & homemade granola bars that are a staple in our house. That is a wonderful idea!! I can’t wait to see what you try and what everyone else tries! Hmm…..now I need to think of some new things to try! We recently made a bed from scratch. Most people are confused when we tell them. They think we assembled a bed, from a box. In fact, we built the bed with no design from lumber. It turned out great and will be great for moving! I’m thoroughly impressed and inspired! This sounds great! I have made most things from scratch, but the summer has been an absolute nightmare and I got very slack in this area. This will be just the jumpstart I needed! I’m thinking about the things I can make from scratch but don’t always do so, for time or hassle reasons: ice cream, hummus, and especially bagels. I love bagels even though they’re mostly empty calories but my goodness!, the authentic thing is a hassle. The ferment, ideally with the dough in bagel shape, takes up huge amounts of fridge space. The shape forming gets easier with practice but it’s till more work than biscuits. Then there’s the boiling! No good way to scale that step – my largest pan can hold 3 small bagels but if I try two pans at once I can’t get to the bagels fast enough. So usually I buy bagels or do without. OTOH I can’t remember the last time I bought window cleaner, laundry detergent, fruit wash, or chicken fingers. Or bacon, although home-smoked bacon is more expensive than supermarket Oscar Mayer because I use pastured pig rather than CAFO pig. I have been wanting to home-smoke some bacon! We have an Asian Market with the meat I just need to take the plunge! It’s surprisingly easy. You need one specialized ingredient – curing salt, aka pink salt, aka DC cure #1, aka potassium nitrite, aka saltpeter. You make a dry rub of a little of this, a lot of salt, and your spices of choice. I like savory bacon so I add cracked black pepper, garlic, and bay leaves; for sweet use maple sugar/maple syrup/brown sugar. Rub the meat with this, put it in a ziploc for 1-2 weeks, then wash off the rub and smoke in a smoker or grill for at least 2 hours; the longer the stronger. For your from scratch recipes, if we wanted to follow along each day, is there anything we should buy I’m advance or regular pantry/freezer items? I can’t wait to see what everyone posts. This is going to be fun. Perfect timing. I just recently decided that I am no longer going to buy bread at the grocery store. I purchased bulk flour at a local food coop and I am going to put my bread machine to work on a weekly basis. I have good intentions, but poor follow through. I have ingredients I’ve bought to make homemade laundry detergent and such, just sitting in my laundry room. And ideas pinned and saved all over the place for other things that I haven’t ever quite gotten to. So, hopefully I’ll find some much needed motivation to actually get some of this done! Thanks! I love this idea as a challenge! We already do most of our cooking from scratch, but I rarely make any cleaners. I just use vinegar, baking soda or borax. Next week I am tackling my first attempt at spinning my own yarn, so I guess that can be part of my challenge to myself. I’m excited! We make most of our food from scratch (so much better for you without all those preservatives), and dabble with other dyi projects. Never considered blogging about our under-the-bunkbed drawers, but now I’m thinking I should. They work so we’ll, we take them for granted. I also have some sourdough starter that I should proof . . . Very excited to join in! I recently started making my own bread and now my family won’t stand for store bought. My most recent switch was to homemade yogurt! I have some “steeping” currently & it is so much better than anything available in the store. After reading this post, I was so motivated, I made my own enchilada sauce for dinner tonight. Very easy. I can’t wait to see what other ideas are out there (that I can actually accomplish). I am excited. I cook from scratch most of the time. But do love new recipes and ideas. I always cook/bake from scratch. I’ll be looking forward to some new recipes! This sounds like a neat idea but I’ll have to just watch from the sidelines this time. We’re in the process of buying a home and between working full time out of the house and packing up our current place and being involved in the home purchasing process, I’m lucky to get hamburger helper on the table! lol. Maybe I will finally make that YouTube video on how I make my “famous” Spanish rice. All homemade (ok, canned tomato sauce because my tomatoes from the garden didn’t work out this year). I’m totally participating in this. I have a few ideas already mapped out and I need a couple of supplies for one other (it’s a craft and I need the barrette part). Other than that, I’m looking forward to making even more from scratch based on what’s already in my house! Would love to try some new things… our family is on a budget so things that are made with things that you would ALREADY have at home would be great! Can’t wait to see what you make. Today…Thursday…I am making the dinner rolls from Pennies and Pancakes. I call them the 2¢ rolls.